Alfred Manual Martin was born in Berkeley, California, on May 16, 1928, of Italian-Portuguese descent. He throws right, bats left. Has black hair, brown eyes, is 5' 11" and weighs 160. 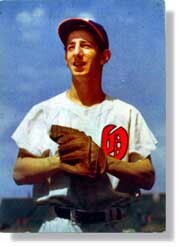 He began playing baseball for teams sponsored by local businesses on the sandlots of Berkeley, California. Later, while attending Berkeley High School, where he won awards in baseball and basketball, making al-star teams in both sports, he also played for the Junior Oaks, sponsored the Oakland Oaks of the Pacific Coast League. After graduating from high school, he was recruited for the Oaks' Idaho Falls farm team in the Class D Pioneer League. He played in 32 games, came to bat 114 times, and had an average of .254 with seven doubles and 12 RBI's for Idaho Falls in 1946. The following year he moved up to the Oaks' Class C club in Phoenix, Arizona, where he had an average of .392, with 230 hits, 48 doubles, 31 stolen bases, and 174 RBI's in 130 games. By the next year, he was playing for the Oaks. The 1948 Oaks, made up primarily of veteran players, have been characterized by many of the writers as "old men." Several of them had turned down big league offers to play on the West Coast. They took a paternal attitude toward the impetuous young infielder from the Berkeley sandlots, whom they have called "the Kid." Hence, the nickname "Billy (the Kid)." When the Oaks' regular second baseman, Dario Lodigiani, was injured early in the season, Billy was put in at second base. After Lodigiani returned, Billy continued to play at second, third, and even shortstop. While he didn't play in a lot of games, Billy batted .277 for the Oaks in 1948. A page from Billy's High School Yearbook.